What is the Hasselblad True Zoom? One of the great appeals of Motorola’s (or perhaps that should be Lenovo’s) Moto Z range is the modularity offered by its Moto Mods. These smartphone attachments cleverly attach to the back of the Moto Z range through magnets, making connecting and swapping mods a breeze. 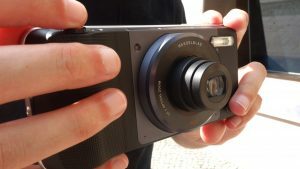 One such Moto Mod is the Hasselblad True Zoom, which, as the name implies, adds some true optical zoom capabilities and draws on the famous Hasselblad name. The Swedish camera manufacturer is known for its super-expensive medium and large format cameras. This is an aspirational Mod, then. Sadly, it doesn’t live up to the brand. With the equivalent of 10x optical zoom made for those who want to get closer to the action without resorting to dreadful digital zoom, the Hasselblad True Zoom proves to be a useful addition. But its camera capabilities as a whole won’t rival dedicated compact cameras at a similar price and some aspects, such as video, can be inferior to the Moto Z’s standard camera. For anyone with a photographic background, the one thing that can feel a little alien when shooting with a smartphone is awkwardly holding the phone itself. 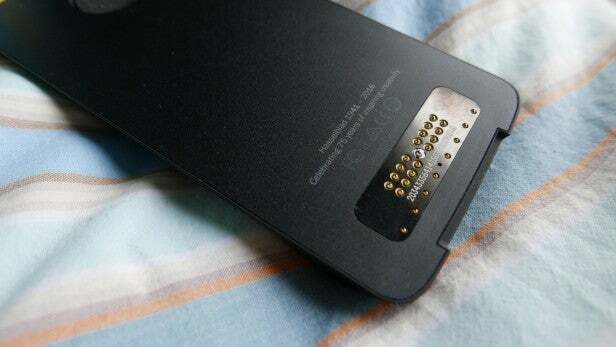 With the rush to make phones thinner and lighter, it means there’s not a whole lot to grab hold of. There’s something satisfying about holding a proper camera that gets lost along the way, and part of that is having something to grip hold of. To counter this, Hasselblad has adopted some tried-and-tested camera standards and the True Zoom looks very much like a traditional camera. For starters, the True Zoom adds some extra girth with a dedicated camera grip towards the right-hand side, which your palms naturally contour around, providing easy access to the dedicated two-stage shutter button. 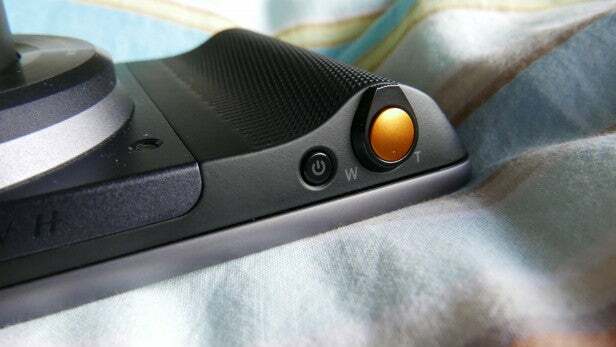 The grip has a leather-like texture to it as well, another nod to traditional cameras. It obviously adds some size to your Moto Z, but the whole thing still fit comfortably into a pair of jeans, although it’s not something I kept attached all the time. A handy case is included to stow the True Zoom away, and it’s also big enough to hold it when attached to the Moto Z as well. Like a dedicated camera, the shutter button can be half-pressed to lock the autofocus and fully engaged to release the shutter, which will be instantly familiar. My only complaint is how mushy the shutter button feels, and that there’s not enough distinction between a half-press and a full-press. Akin to the travel of a keyboard’s key action, there’s something to be said about a satisfying shutter button. There’s some visual flourish to the shutter button, adopting an orange shade to commemorate the long-standing camera company’s 75th anniversary. Integrated alongside the shutter button are the zoom controls, which will again feel instantly familiar to anyone that’s picked up a compact camera. Frustratingly, the zoom rocker is incredibly sensitive, so it’s very easy to overshoot the zoom length you intended. There’s a small power button to turn the camera on and off manually, but opening and closing any camera app will do this automatically as well. Previous smartphones have dabbled with optical zoom in the past, the Samsung Galaxy K Zoom and the Panasonic CM1 to name but two, but being able to add on and take off the True Zoom means not having to deal with the added size of the camera components all the time, which is a real bonus for part-time shooters. The only real omission compared to a dedicated camera I felt was the lack of a tripod thread, but you can probably find a smartphone holder with one that would do the trick. 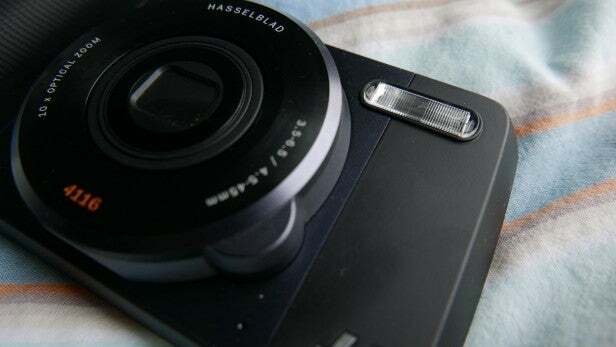 Otherwise, the Hasselblad True Zoom does a surprisingly effective job of turning your Moto Z into something that looks and feels like a compact camera. The True Zoom uses your connected Moto Z’s battery, so expect that to deplete quicker. Annoyingly, the Moto Z wouldn’t let me connect a USB-C cable to charge at the same time as using the True Zoom, throwing up an on-screen message. It’s not made clear why you can’t shoot and charge at the same time, either. 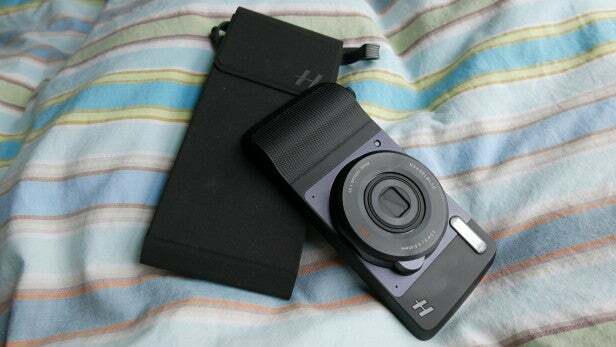 The post Hasselblad True Zoom Moto Mod appeared first on Trusted Reviews.